The exterior is made from PU leather, and the interior is lined with non-scratch microfibre material so you don't need to worry about any damages. The case works as as a stand and can be positioned in many different angles,either at a low angle to aid typing or to support the tablet at a steeper angle more suitable for photo slide shows / movie viewing. There is also a wallet pouch designed in case,where you can conveniently store your documents or other paperwork. Magnetic strip built inside that instantly wakes up Phone when opened, and makes it go to sleep once you close. √ Precision cut-outs for all ports, access to all controls and functions without removing the case. √ Smart Design allows you to grab cards and money easily and conveniently. √ Screen Protector: provides complete all-around protection for your phone, including the display. The phone is well secured in a close-fitting shell to ensure that it does not fall out in a case. 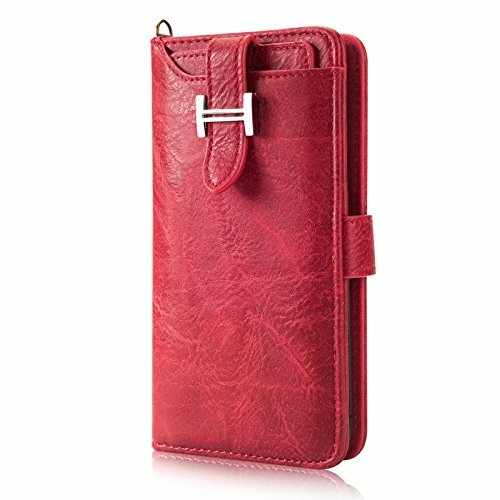 Closed, the front flap of the leather case protects the display and prevents fractures in a case. √ Detachable Magnetic Phone Case You can carry the phone case with your wallet or you can take it out of the wallet if you just want to carry the phone without the purse.